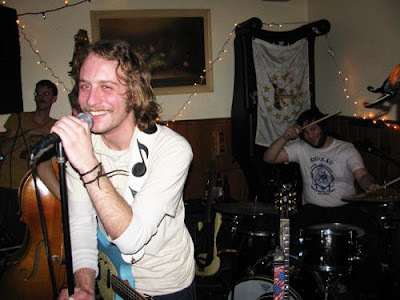 Deer Tick is a rockin band from Providence, RI. From humble beginnings in 2004 as a drum and guitar duo, the band has progressed to a quartet. With the release of their albums War Elephant and Born on Flag Day, they've won a lot of praise for their mean blend of roots rock. Lead singer John McCauley lends his unique vocals to heartfelt songs to give these guys their great sound. I'm sure you'll be hearing a lot more about these guys soon. Dawes is an Americana quartet from California. They play some really awesome tunes, remeniscient of The Band, My Morning Jacket and the like. They even recently played a Daytrotter session which you can find right here. Their album North Hills is worth checking out. Both bands are currently touring all over the USA and Canada together, with a lot of great shows in New England coming up, including Portland's famed Space Gallery and Northampton's Iron Horse. Deer Tick will even be playing the famed Newport Folk Festival on August 2nd! They'll be making a stop in Connecticut at The Space on July 23rd. Playing with them will be The Backwater Racket. Hailing from Fairfield, CT, they describe themselves as "Porch Music." It's a very fitting description, as they play a lot of folk and bluegrass themed songs. They've got a new album coming out soon, and from what you can hear on their myspace page, it seems like it's going to be pretty damn good. You can get tickets on etix, or for no survace charge, purchase them at Redscroll Records in Wallingford. THIS SHOW WAS PREVIOUSLY AT THE WALLINGFORD AMERICAN LEGION. ALL TICKETS WILL BE HONORED. Big thanks to Manic Productions for setting this show up.